Blind spots are present in nearly every vehicle on the auto market, aside from convertibles and other vehicles without a roof. These blind spots are essentially the areas surrounding a vehicle which a driver cannot see, as there is something hindering their vision. Typically, blind spots are located over the drivers left and right shoulder and are caused by pillars connecting the body of the vehicle to its roof. Furthermore, passengers and other objects being transported in the vehicle can also create blind spots. Have you been involved and injured in an accident that was not your fault? The auto accident lawyers at Tapella & Eberspacher have recognized the great amount of accidents caused by blind spots, and have represented dozens of injured victims of these accidents. If you or someone you love has been involved in an accident resulting in serious injuries, our attorneys are here to help. We are prepared to fight on your behalf to achieve the MAXIMUM compensation for all of your losses and damages. For more information about how we can help you, complete the “Free Case Evaluation” form to the right or call us today at (855) 522-5291. We offer accident injury victims 100% FREE consultations and we only get paid when we win. By adjusting your mirrors correctly, and checking twice for vehicles before changing lanes, drivers can greatly reduce the number of blind spot accidents which occur on our roadways each day. There are a number of things a person can do in order to eliminate blind spot collisions. Also, by abiding by all traffic laws, practicing defensive driving techniques, and paying attention at all times, we can each do our part to prevent these accidents from occurring. 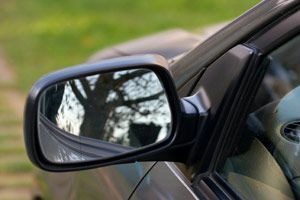 Adjust Side Mirrors: Side mirrors can be adjusted beginning with the right mirror by leaning as far to the right side as possible and angling the mirror so that the side of your vehicle can barely be seen. Next, you can lead as far to the left side of your vehicle as possible also adjusting the mirror so the side of your vehicle is barely visible. This will expand your vision of the roadway and greatly reduce blind spots. Blind Spot Mirrors: By purchasing a set of blind spot mirrors, you can increase your visibility and help to reduce any blind spots. Blind spot mirrors can be found in most auto parts stores throughout Illinois. Convex Mirrors: These mirrors can be used to replace your normal rear-view mirrors, which can help to increase visibility. Reducing Speed: By reducing your speed of travel, and driving at the speed limit, drivers will be able to maneuver better around sudden hazards. If you or someone you love has been involved in a blind spot accident, which resulted in serious injuries or death, the victim and victim’s family may be entitled to compensation for their losses and damages. The team of highly trained attorneys at Tapella & Eberspacher have represented thousands of injured victims over the years and are prepared to fight for your justice today. With locations throughout Illinois and Missouri, our attorneys are able to help injured victims throughout these states and elsewhere needed, all while operating on a contingency fee basis. This means that we will not charge you for any of our services unless a winning verdict or settlement has been established and you recover. For more information about blind spot accidents, or our law firm, we invite you to contact us at (855) 522-5291 or complete the Free Case Evaluation form on this page. At Tapella & Eberspacher, we're here to help and only get paid when we win.